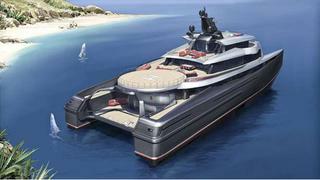 Are Swath platforms the ideal superyacht design? Abeking and Rasmussen’s vision of its SWATH private superyacht in action. 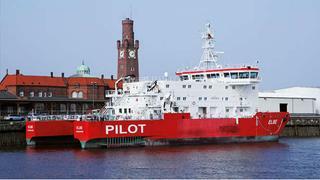 Elbe is a commercial pilot Swath: spot the difference between this and a private SWATH. The design of a SWATH is as extraordinary as its initials imply and may not mean much to you even when spelt out: Small Waterplane Area Twin Hull. But it could be the next design phenomenon to be taken up by clients who seek ever-increasing comfort and volume for their homes on the sea – a new style of expedition vessel, if you like. The evidence comes from discussions with Till von Krause of Abeking & Rasmussen (A&R), which builds SWATHs for commercial applications, and Andrew Langton of Reymond Langton Design. Together they have been working on developing a 62m SWATH with interior volumes equivalent to that of an 80m monohull, for clients whose demands include travel in extreme comfort, staying at anchor on a stable platform in almost any weather conditions, use of an on-board helipad for guests and limousine tenders for ship-to-shore transfers. To give you some idea of what a private SWATH looks like we take you back to an article on the 41m Silver Cloud (Boat International, April 2009) the first to be built at A&R for her American owners Alex and Renate Dreyfoos. They say it causes quite a stir wherever she goes. In just two years they have covered thousands of sea miles on board, encountering some nasty weather systems along the way that would normally have kept them in port – but such is the construction of these vessels that weather patterns are no longer a problem. Extraordinarily, before the couple took delivery of Silver Cloud they were in danger of having to hang up their logbook and abort adventurous plans because of the oldest on-board affliction: seasickness. Even zero speed stabilisers on their previous yachts did not give enough stability in a swell and it soon became apparent that a monohull, however well-built, was not going to work. Alex Dreyfoos used his engineering skills alongside the expertise of A&R, and the result is a perfect cruising vessel for all weathers – and such is its stability that seasickness is no longer an issue. SWATH is an innovative hull concept for smooth service in rough seas. The idea was taken from the principle of semi-submersible offshore rigs, designed to provide a working platform with minimised motion in open sea. The origins of a SWATH concept date back to the early 20th century but it was 1946 before a Canadian, Frederick Creed, was able to take out a British patent on his version. The US Navy became interested and carried out extensive design and test work in Hawaii, from which Dr Tom Lang obtained a patent for a Swath with additional stabilising fins. Just as importantly, the navy put a massive effort into design software, which later became available to purchase. ‘Without computer-aided design, a practical SWATH would hardly be possible,’ explains A&R’s technical director, Dr Klaas Spethmann. The buoyancy of a SWATH ship is provided by its submerged torpedo-like bodies, connected by single or twin struts to the upper platform. The cross-section at sea surface level is minimised so very little of the vessel is exposed to the lifting forces of the waves. Abeking & Rasmussen has developed SWATH technology over the past 15 years, on the back of its long-standing experience in hydrodynamics, lightweight construction, special materials and leading-edge ship design. With the know-how gained from full-scale service data of reference ships and special software tools A&R is now in a position to design and deliver SWATH ships under the brand name Swath@A&R.